One of the more interesting products I’ve run into so far at CES is Muse, a mindfulness and meditation band that wraps around your ears, temple and forehead that reads your brainwaves in order to facilitate better meditative practices. The band calculates brain activity through carefully placed sensors and sends the signal to your smartphone via Bluetooth. 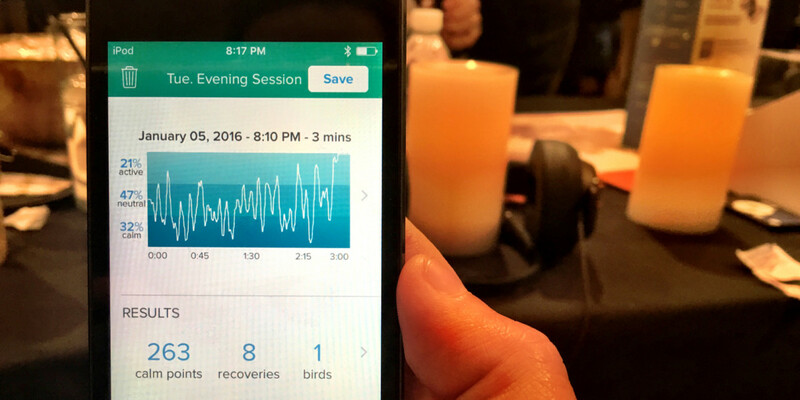 From there, the app charts brain activity throughout the session, as well as providing a subtle reminder when your mind begins to wander rather than focusing on your breathing. After placing a set of headphones over your ears and trying to situate the small plastic band, you run a quick calibration exercise that asks you to think of things you associate with certain words — school, historical figures and vegetables, in my case. From there, your meditation session begins. During the session, the app plays calming natural sounds, such as running water and waves when you’re relaxed, or strong wind and rain when you start to lose focus of your breathing and your mind starts to wander. From there, it’s as simple as recognizing the sounds and re-focusing your thoughts to your breath in an attempt to empty your mind for better meditation. It was rather tricky to remain that focused on my breath in a busy room full of people, but for the few moments that I found myself in a relaxed state, Muse seemed to be effective at reminding me that I was drifting off course and I needed to do a sort of mental reset. The app though, for a data nerd like me, was the real prize. Finding out just how relaxed I was during my meditation session provided a bit of quantitative measure to a typically qualitative exercise. Muse is available online for $299.